This Standard covers process heating systems that are defined as a group (or a set, or combination) of heating equipment used for heating materials in the production of goods in an industrial plant. These systems, commonly referred to using terms such as furnaces, melters, ovens, and heaters, use heat sources such as fuels, electricity, steam or other fluids to supply the required heat. 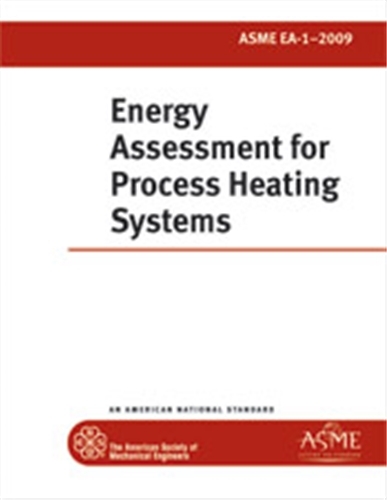 This Standard sets the requirements for conducting and reporting the results of a process heating energy assessment (hereafter referred to as an assessment) that considers the entire system, from energy inputs to the work performed as the result of these inputs. An assessment meeting this standard need not address each individual system component or specific system within an industrial facility with equal weight; however, it shall be sufficiently comprehensive to identify the major energy efficiency opportunities for improving the overall energy performance of the system. This Standard is designed to be applied primarily at industrial facilities, but many of the concepts can be used in other facilities such as those in the institutional and commercial sectors. To view ASME Standards in this format requires the download of the free Adobe® Reader®. Authorization requires download of an Adobe-approved plug-in from FileOpen Systems, Inc. and Internet access to complete the authorization process. Security permissions of these files allow printing and the addition of comments. Once authorized these files may be accessed with or without connection to the Internet.